This is an established, detached, 2 bedroom villa. Situated on the beach front in an enviable position, it has stunning views over the sea and the UNESCO protected heritage site of ancient Paphos. The property is paved all around with patio area to front and barbeque area with pergola to the rear. There are 2 bedrooms (1 double with veranda and a twin) and shower room with W/C. All rooms have air conditioning to keep you cool in the summer heat! Aircon is included in the price of your holiday as are transfers from and to Paphos airport . WiFi is available free of charge and English tv programmes and catch up also available as standard. Enjoy a stroll along the beach only 100 metres away or a walk along the coastal path around the old city walls and lighthouse to Paphos Harbour 20 mins away. Bathroom with W/C and shower. The Villa is 100 metres from Faros beach and has an uninterrupted view over the beach and Lighthouse . There is a beach bar and café on the beach. The harbour is a 20 min walk along the beach. There is room for 6 in the living room and 4 in the dining room. There is a tv and wifi. To prepare food you will find a cooker, an oven, a microwave, a fridge, a freezer, a kettle, a toaster and washing machine. Property is in a perfect location for all the amenities. The property itself is like being at home but will much better weather. Everything you need is on hand and Janet is only a phone call away to deal with any issues. It was great to stay there and we will look to stay there again in the future. 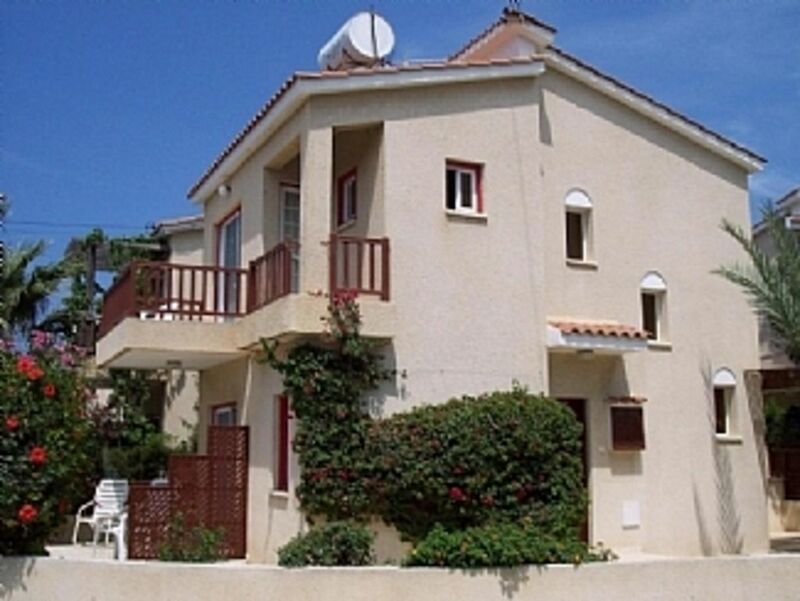 I would recommend this property to anyone thinking of staying in Paphos. Thank you very much, very friendly and helpful hosts! Special thanks for the transfer! 100 meters from the sea and the beach. Within walking distance are many bars, restaurants and a shopping center. The house has everything you need for living and relaxing. This was our second stay in the villa and we would have been more often but unfortunately it was booked when we were heading to Paphos. It's extremely good value for money especially with private taxi transfers and air con included in the price, a lot of other places charge extra for air con and in July I can imagine a hefty bill could be built up. The location is great, a few minutes walk to the nearest beach and a minutes walk to Tomb of the Kings road with a multitude of bars and restaraunts and the main bus route to Coral Bay or the harbour. The walk to the harbour is about 15 to 20 mins but in the July sun the bus service is probably the better option unless you're walking early morning or late at night. Despite the close proximity to the bars etc the villa is very peaceful and quite so you get the best of both world's. There's loads of space around the villa and great to get a bit of shade and outside dining. Theres also a great balcony upstairs with fantastic sea views. The villa is a good size with loads of storage and the toilet/shower room has been extended since our first visit. There's also free Wi-Fi which is great especially when you have kids! The TV is through an internet connection which can buffer sometimes but this is a good trade off for the huge amount of channels, other places we've stayed usually just have a couple of news channels and the rest are foreign. Having said that, we weren't really there to watch TV anyway but there's a load of kids TV channels which can provide a bit of respite! Janet, who looks after the villa for the owner, is lovely and would be a mine of information for anyone who hadn't been to Paphos before. The owner, Tony, was in touch with plenty of information and very pleasant to deal with. He was also extremely kind to let us have a late checkout out for our evening flight and this was greatly appreciated by us all. We won't hesitate to book again in the future and I would recommend the villa to anyone. A wonderful home from home that is perfectly located in a quiet spot a stones throw from the beach. The harbour is a fifteen minutes walk and all the other local attractions are less than fifteen minutes walk. The villa was excellent, really well appointed, 100 metres from the coastal promenade. We were able to have breakfast and lunch on the terrace, the weather being mostly warm and sunny. The area is well served for bars and restaurants, the harbour 25 minutes walk. Pick up from the airport was an added bonus. It was also great value for money, and I would have no hesitation in thoroughly recommending this holiday property. Hi Lorraine and Tom. Thankyou for posting a review and good to hear you enjoyed your stay. Look forward to hearing from you in the future. Have a great Christmas. Janet sends her best wishes too. Villa Sirena is situated right on Faros ( or Lighthouse ) beach with uninterrupted views over the sea and the historic, UNESCO protected , old city walls and Mosaics. There is a coastal path leading to the picturesque Harbour about a 15 mins walk away. The Villa is a 15/20 mins drive from Paphos airport. Transfers from and to Paphos airport are included in the price. The Villa is airconditioned throughout and this is also included in the price. Booking Notes: 25% deposit required to secure the booking. Balance due 56 days prior to departure. We accept all payment methods. Changeover Day: We try to accommodate any changeover day/time. Notes on prices: Substantial discount of £100 on second week price. Prices include transfers to and from Paphos, air-conditioning and welcome pack.